Mentone is a town in Harrison and Franklin townships, Kosciusko County, Indiana, in the United States. 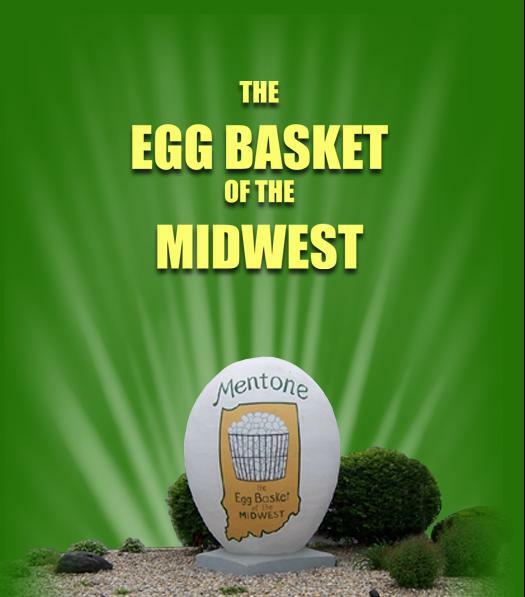 Mentone is the self-proclaimed “Egg Basket of the Midwest” because of prolific commercial egg production in the area, and holds an Egg Festival annually in early June to celebrate its heritage. A large concrete egg stands near the town center and is considered locally to be the “Largest Egg in the World”. The Lawrence D. Bell Aircraft Museum is located within city limits. The idea of the egg was conceived by Ed Ward who was the manager of the Northern Indiana CO-OP Association, and some of the egg farmers in and around Mentone. Hugh Rickel of Palistine designed and built the egg. It was constructed in the building next door to the late Dr. Davidson’s dental office which was on the northwest corner of Main & Morgan St. in late 1946. As the story goes, Dobbs & John Miller operated a sheet metal shop in Mentone at the time. They wanted to make the egg out of sheet metal, but Rickel didn’t think it would last. Rickel then made the egg from steel rods welded up and down then ran one up the center. The concrete plastering was done by Pete Goble we thought, but we later heard it was done by Clyde & George Reed. If you have any evidence, let us know so we can clear this up. The egg was then painted by Harry Meredith. After it was finished, it was loaded on a truck (it took 12 men to load it as it’s estimated to weigh at least 3,000lbs!) and then taken to Warsaw and placed on the courthouse lawn where it stood for two weeks to advertise the Mentone Egg Show. In searching through the Mentone papers, a picture of the egg was found on the courthouse lawn (in the March 13, 1946 issue of the Mentone CO-OP News). We assume the egg must have been constructed earlier that year. Fred Benson of the Board of Directors of the Northern Indiana CO-OP Association said that the egg was returned after the 2 weeks at Warsaw and we didn’t know what to do with it! So the CO-OP donated the land where the egg stands today on the corner of Main and Morgan streets.